It must be said, I am a big fan of Belgian food and for me the whole country is a foodie paradise. There are top restaurants with plenty of stars but on this trip we found great quality food just about everywhere, from the more expensive establishments right to the humblest roadside frituurs where we ate lip smacking chips. Son was amazed and more than impressed to find frites on the menu in virtually every restaurant we dined in. Always light as a feather, my favourites were from a street corner in Ostend, topped with homemade mayonnaise and beyond delicious. Moules frites seems to be the national staple – that works for me. We ate seafood in different places, always fresh and delicious but the mussels – especially in Brussles get my vote every time. Available with all varieties of sauce they were just divine. We were all in agreement that Belgian handmade chocolates are the best in the universe. The Swiss might want to argue that point, but having tried a very large quantity of chocolate in just about every town we visited in Belgium, my waistline and I feel qualified and expert enough to comment on this. Leonidas are my top pick, you buy them loose, apparently they are made with fresh cream and don’t keep well – who on earth would ever want much less be able to keep them. The beer went down very well with Husband and me. We sampled a variety of different types, my favourite is Kriek but I am also partial to a Hoegaarden, he enjoyed Duval and Chimay but remains undecided. His argument is that he needs to return and recommence the sampling process with a larger number of items before casting his vote. Who am I to argue with that? 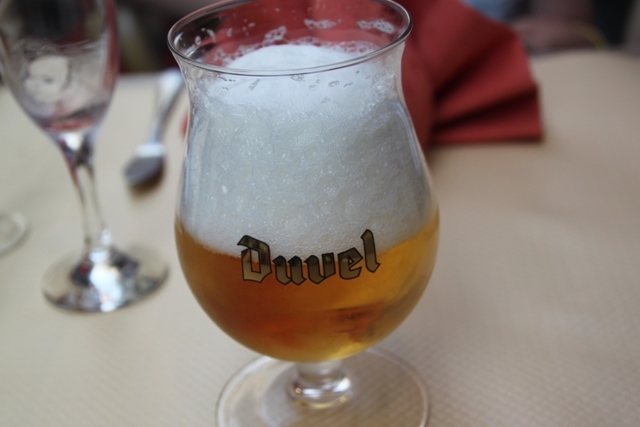 There are more than seven hundred varieties of beer and Belgium is justifiably proud of its brewing tradition. A tiny country with more than one hundred breweries, the majority seem to be local beers and specialities of a region, city, town or village with some made by monks. The other great thing about the beer is each has its own distinct and beautiful glass. You can instantly tell by the glass what everyone is drinking, I love that. Chocolate and beer did it for us but Son wins the award for waffle eating. Thick, fluffy waffles with chocolate sauce (you could have other flavours and whipped cream or powdered sugar) but this boy knows what he likes and it was chocolate sauce all the way. We bought them in Brussels, Bruges, Ostend, Ghent and De Panne – winners every time, he never tired of them. The beef stew is delicious, the bakeries sell intricate and mouth-watering treats, I could just go on forever singing the praises of Belgium’s culinary offerings. We came home without any foodie souvenirs, just a few extra pounds on our waistlines (except for Son where infinite quantities of chocolate and sugar make no difference) but again, we were all in agreement that it was well worth it. I have been thinking about visiting a friend in Brussels but wondered what I would do with my time there. Now it is clear – eat! Great post, glad you enjoyed it. Eating your way around Brussels – that sounds like a great thing to do, we gave it a good go and loved every second!! Even better with a resident tour guide though – they’ll know all the right places for all the best food! We were in food heaven – so much to choose, all so good, drooling just thinking about it……we also wouldn’t mind a trip back!! I dithered on that one then decided against bringing any home – too much temptation having already had so much overindulgence!! I wish I had a box or two stashed away now though…. What a delicious post. My stomach actually rumbled as I read. I completely agree with you regarding Belgian chocolate being the best in the world. It’s one of the things I miss about not living in Europe. Belgium does great street food. I’ve eaten many a tasty meal that way. It’s such a great place to visit Kamila – not least for the food, every single thing is so delicious, we definitely recommend! Totally agree on the chocolate and the beer! I used to be partial to moules in pre-veggie days so have never tried them in Belgium. (France, yes, remember a delicious garlicky portion while waiting for a ferry in Calais but that was decades ago.) I can admire the picture though. Garlicky mussels sound great right now Anabel and it’s not even lunchtime!! They do those moules so well in Belgium, often thought about going veggie, just don’t know if I have the willpower!! It’s second nature now – not sure if I could digest meat / fish anyway – but it does take will-power at the start. Ha – yes, the food is so great and one of the reasons we loved our time in Belgium so so much!! Ha ha – I know just what you mean George. My son was looking over my shoulder while I wrote this and was almost salivating at that waffle – his question too was when are we going back!! Nothing to do with sights or culture, all to do with waffles. This might be the first trip I take based on a picture of food..:). Thank you once again, Joy. My older son had the mussels in Brussels but younger son went with cheval (horse). Anytime we have had mussels since, that family story comes up. We also loved the frites, chocolates, and waffles. I’m not a beer connoisseur but we did try the beer, too. Your post brought back great memories. I’ve never been brave enough to try horse (or not that I know anyway!! ), our son thought he was being super adventurous trying a mussel!! I’m not so much into beer usually but here I did like it and loved everything else – a bit too much!! It all looks delicious! I’m a fan of the beer and waffles, but haven’t ventured further. We just returned from a quick trip to Brussels, but ate mostly stadium food, as we went for a One Direction concert for my daughter. 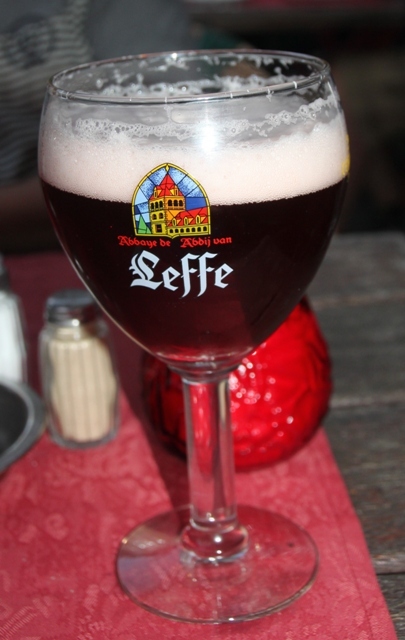 Bruges is on our list–maybe this fall–I’ll take up the foodie call and try to be more adventurous then. Thanks for the post; always love hearing of your adventures! I secretly would love to see a One Direction concert – however with a son I don’t think that’s likely to happen!! You have to try the other food – highly recommended!! We spent a week in Bruges after Brussels and had a great time – you’ll love it! Holy cow! This makes me want to book a trip right NOW!! So true Kerry – we are salivating here just thinking about all that yummy stuff – my Son asked when we are going back!! Both were superb – food heaven! LOL! I like the Husband thinks! I’d want to sample my way through the country as well. Pink beer! ?? I want to try it. OH MY GOSH! That waffle looks sinfully delicious! I envy son’s ability to eat those huge, sweet waffles without gaining a pound! I envy that skill too – it doesn’t work that way for me at all unfortunately!! The pink beer is divine – highly recommended!! Looks like I need to go to Belgium again! We need to go back too!! I agree! While traveling through Belgium I had the best fish and chips I have ever tasted (Ostend) , and the best chocolate ice cream and roasted baby potatoes (of all things) in Brussels. I never thought about good food in Ostend but we got amazing chips and fish there from a little stall on the seafront – drooling just thinking about it!! Your pictures make me want to jump through the computer! We just went to a Belgian brewery in upstate New York and they had surprisingly good food. I love Kriek beer and Duvel as well. Waffles, don’t get me started! Makes me want to go back to Belgium. Loved this post! 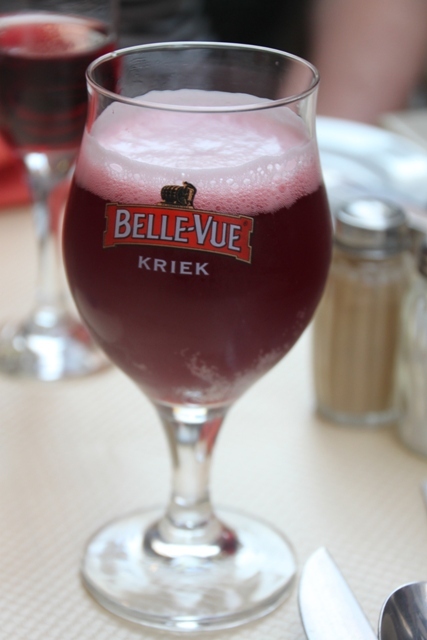 Kriek and Duvel are amazing Kristen – that Belgian brewery sounds like a place I wouldn’t mind visiting. We were surprised just how great the Belgian food was – one of our surprising highlights of this trip. 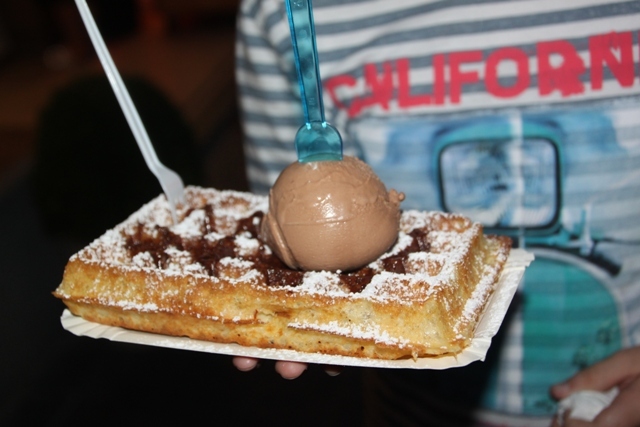 LOVE Brussels, such an interesting city, these photos of food are amazing! Did you also have the fries with the mayonnaise? I am drooling looking at that bucket of mussels, OMG, they make me want to go back to Belgium! The fries with mayonnaise – I just loved those, unbeatable!! Mayonnaise and fries stop the presses! Other than clogging my arteries I am all in with this culinary advancement. Thank you so much for your post- gorgeous beer photos as well. Glad your son hit the belgian waffles! He hit the waffles with gusto Hilary – definitely can’t say he didn’t sample his fair share!! We hit everything else with gusto!! Gorgeous photos! And I’ve never had Kriek, although I am partial to Maredsous. I’ll have to look out for it! I don’t know Maredsous – thanks for the tip Andrew – now definitely one to look out for! Oh don’t get me started on Italian food though Diana – soo good drooling just thinking about it!!! Love Belgian food too, even though I don’t eat meat or seafood, so I pretty much just live on frites and chocolate when I’m there (not that I’m complaining!). And one of my favourite gelaterias is in Brugge. Ooh, and fruit beer, I love kriek. I got to visit the Cantillon brewery on my last visit, which I should be posting about soon. Frites and chocolate doesn’t sound at all bad to me!! Looking forward to the post about the brewery – don’t know it, sounds like it would be right up our street though Jessica! I completely agree – the food in Belgium is the best I’ve ever had. I stopped there to visit a friend on my way back from a work trip in Amsterdam, and couldn’t get over the quality. My husband who has never been has been trying to plan a trip there ever since..
WOW … now that’s a combination. Because you’ve enjoyed, we envy. We did enjoy – very much!! Great beer photos! Yes, these are also my favorite Belgian “food groups” along with frites and mayo. I am enjoying all your posts and photos, but this is one of my favorites. Great job! Thank you Suzy – we loved the Belgian food so much I just had to write about it!! A delicious post! Many thanks for sharing! 😃😄 wishing you a great week ahead, Joy! Thank you – everything was most definitely delicious!! Hope your weekend and week is a great one too!! Mussels, chocolates and fruity beer – I was in food heaven Rosemary. I suppose I hadn’t associated Belgium with great food but it most definitely was. We all loved just about every meal and all those treats – well what more can I say!! We loved it in Belgium and the food played a massive part in that. Hope you enjoy your weekend – we are keeping our fingers crossed the sun stays shining here!! 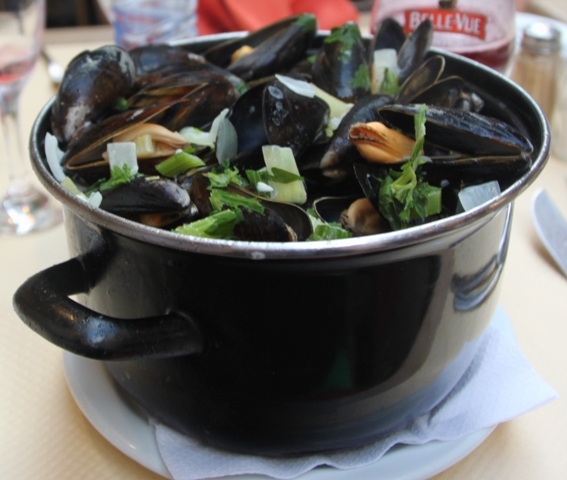 Mussels are not the same anywhere else – Belgium trumps on that one for sure!! As for the chocolate, well….. and I miss the Kriek sooo much. So much to miss for you here!! Difficult to find fruity beers in the uk.. but there is a pub in Leeds that makes organic apricot beer, and it’s quite good ! I’ve been through Belgium twice, but never stopped yet. Considering I travel to eat, sounds like I might need to throw this on the itinerary next time. Definitely worth sampling some of their food – it’s superb!! There is nothing like Belgian food (and beer) to make you drool!! !